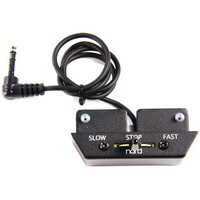 The Half Moon Switch allows you to control the speed of the built-in rotating speaker simulation and an external rotary speaker connected via the 11-pin Leslie connection. The Half Moon Switch offers 3 speed settings consisting of slow – stop – fast and is easily attached without the use of any tools at various locations along the left side of the lower manual. This entry was posted in Nord and tagged Keyboards-and-Pianos. Bookmark the permalink.